Portland activists answered a call Nov. 25 from caravanistas and the Mexican Support Committee for nationwide actions in support of the Central American Caravan. 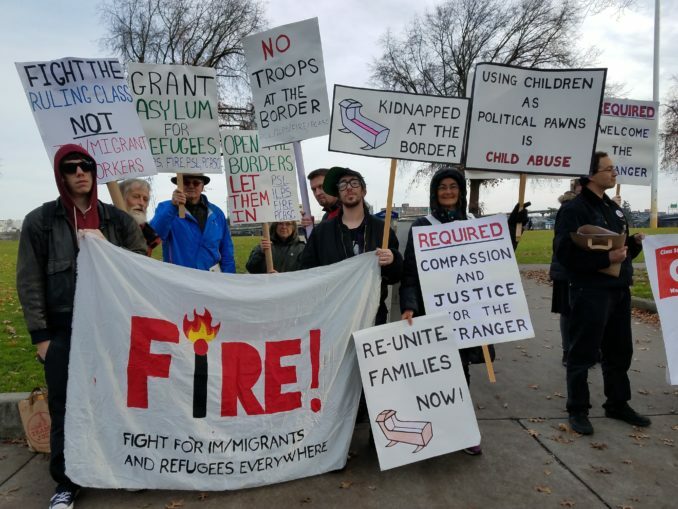 A rally called by FIRE (Fight for Im/migrants and Refugees Everywhere) was organized by four local activist groups and reported on by two major Portland television stations. Speakers emphasized that, like im/migrants from all over the colonized world, the caravanistas are fleeing the brutal exploitation and violence of their colonial governments, which are backed by the U.S. government and ruling class. Trump continues to play to the most racist and right-wing elements in his electoral base, calling the struggling refugees “bad people,” “invaders” and “criminals.” He ordered 15,000 military troops to the border, at a cost of $2 million, and gave them the go-ahead to use lethal force against the refugees. The growing tide of international public support for the caravan, including in the U.S., opposes this bigotry, and more and more people are gathering at the border to welcome the caravanistas. The rally handed out educational leaflets and encouraged people to donate financial support or go to the border to help.